It is not surprising that tourists visiting Lower Normandy flock to the Côte Fleurie. Offering a beautiful coast with chic seafront villas and perfectly kept gardens. WHY DISCOVER THE CÔTE FLEURIE? Located between the Côte de Nacre and the Côte de Grâce, the Côte Fleurie is a must-see for tourists visiting Normandy. 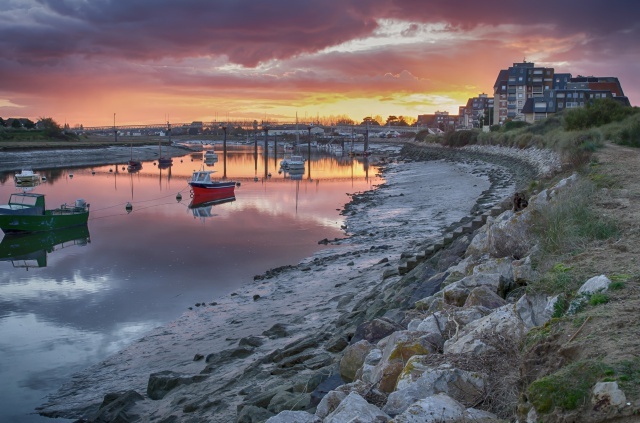 With beautiful countryside from Trouville-sur-Mer to Honfleur and picturesque small seaside towns it simply can’t leave you indifferent. Pretty, well-kept gardens that will particularly please lovers of green spaces. And finally, grand elegant villas to admire. If you are going to the Côte Fleurie for the first time, we suggest you start in Deauville. You can walk along the famous boardwalk and take in the fresh air! Then on to Trouville-sur-Mer with its charming old town, you will easily find a restaurant to enjoy seafood with your family! End your visit with a walk around Houlgate and Cabourg: These small towns are less well known than Deauville and Trouville but as charming, even at the height of season! One thing is sure; this won’t be your last trip to the Côte Fleurie. Lower Normandy has so much to offer, make sure you take time to discover it!